MAKE HEADS TURN: Our exquisite piece of jewellery is a real sterling silver necklace featuring gleaming genuine Swarovski® Heart crystal that will offer you unique shine in all your appearances, perfectly complimenting your elegant style. EXCLUSIVE DESIGN: Exclusively designed and made by Erika & Alex Jewellery Designers (London), this unique sparkle silver pendant necklace with the iridescent finish will make the ideal piece of jewellery for any woman or girl to wear all day against a variety of colourful outfits! AN EXCELLENT GIFTING IDEA: Offer our breath-taking silver necklace in the luxury packaging to any special woman or girl in your life and enjoy their ear-to-ear smile upon opening the elegant gift box! The perfect gift to show them your love on their birthdays, on Mother’s Day, Christmas Day, Valentine’s day or any other festive celebration! NO QUESTIONS MONEY BACK GUARANTEE: At Galaxy Jewellery (England) we take pride in the quality and craftsmanship of our silver pendant necklace with Swarovski® crystal and back our product with lifetime quality warrantee. If you are not absolutely thrilled with our product, please contact us and we will be glad to immediately refund your money in full. 925 Sterling Silver. Crystals size 14mm, pendant 19x14mm, chain length 45cm (18in). Do you invest in authentic quality pieces of jewellery which compliment with their unique shine and glamour your looks? Are you looking for an original way to show your love to your significant other with an exclusive design timeless silver pendant necklace? Treat yourself to the luxury of an irresistible piece of jewellery and make heads turn at your unique elegant accessory! This stunning Swarovski Elements® Crystal Red Heart Pendant, suspended graciously from its delicate 925 sterling silver chain is inspired by nature and features an array of colours to match your outfits on all occasions. Imaginative Jewellery Designers Alex and Erika are now offering you an authentic quality, peerless sparkle silver piece of jewellery. Classy and minimal, featuring a full-cut blue Swarovski heart-shaped crystal with iridescent finish, it makes a classic accessory to wear all day long to brighten up your moments with its unparalleled shine. This amazing silver pendant in the deluxe gift packaging will make the ideal gift to your wife, girlfriend, best friend or even your daughter. A must-have Swarovski® pendant to brighten up the moments of any special woman in your life and show off in the most elegant way your stylish taste! 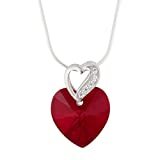 If our authentic design silver pendant necklace with the Swarovski Crystal Heart does not make you 100% happy, we will return your money in full. To us, customer satisfaction is top notch!